2. 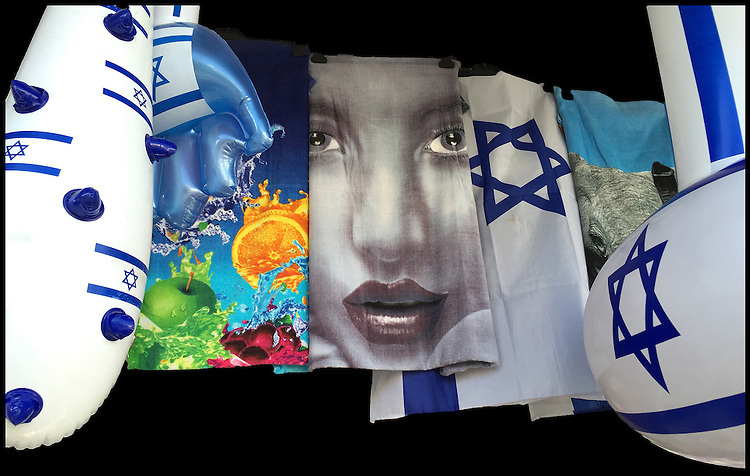 "Jaffa is more than Oranges": beach towels and inflatable toys in a shopfront display, Tel Aviv. When I first made this image in Tel Aviv, what struck me hard was the Semitic face emblazoned on a bath towel. Flanked by the Israeli flag and Jewish stars of David, this storefront seemed to trumpet pride in a quintessentially Jewish nation-state; yet the exaggerated classic Semitic face could represent an Arab or Jew. Tel Aviv was founded in 1909 on the outskirts of the ancient port of Jaffa by Jewish immigrants, many of whom bought orange groves from Jaffa's Arab residents and developed a thriving agricultural trade. But in 1921, this "harmonious co-existence" erupted into riots between Arabs and Jews, who then moved en masse to Tel Aviv. Today, Tel Aviv is the 2nd largest city in Israel (after Jerusalem) and, according to the Global Financial Centres Index, is the 25th most important financial center in the world. So now I wonder, what do these towels signify?